Raymond Chandler--the creator of Philip Marlowe, one of literature's great detectives--signed a contract in 1941 for RKO to film his novel Farewell, My Lovely. The price: $2000. According to Frank McShane's The Life of Raymond Chandler, it was a decision the writer later regretted, blaming the "unparalleled stupidity on the part of my New York agent." Even worse, RKO took Chandler's now-acclaimed novel and adapted it as The Falcon Takes Over (1942), a "B" detective film. It was the third entry in the Falcon film series, based on a gentleman detective created by Michael Arlen in a 1940 short story. 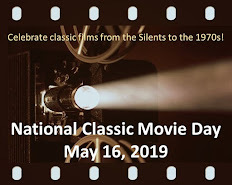 In fact, the film's opening credits state the screenplay was "based on the character created by Michael Arlen" and then in smaller letters, it includes "From the novel Farewell, My Lovely by Raymond Chandler." For anyone who has read Chandler's novel or has seen the superior 1944 adaptation Murder, My Sweet, it's jarring to see George Sanders' upper-class detective filling in for Marlowe. Marlowe's cynical first-person narrative and the seedy settings have been replaced with lighthearted title music and a bumbling assistant named Goldy (Allen Jenkins) who provides comic relief. Sanders, after five movies as The Saint--a similar character--and two as The Falcon, looks relatively bored. 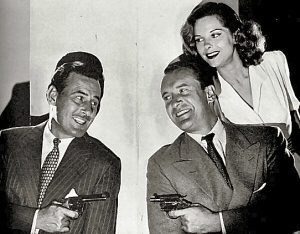 He would make one more Falcon movie, The Falcon's Brother, in which Gay Lawrence is killed off and replaced with his brother Tom Lawrence (played by Sanders' real-life brother Tom Conway). 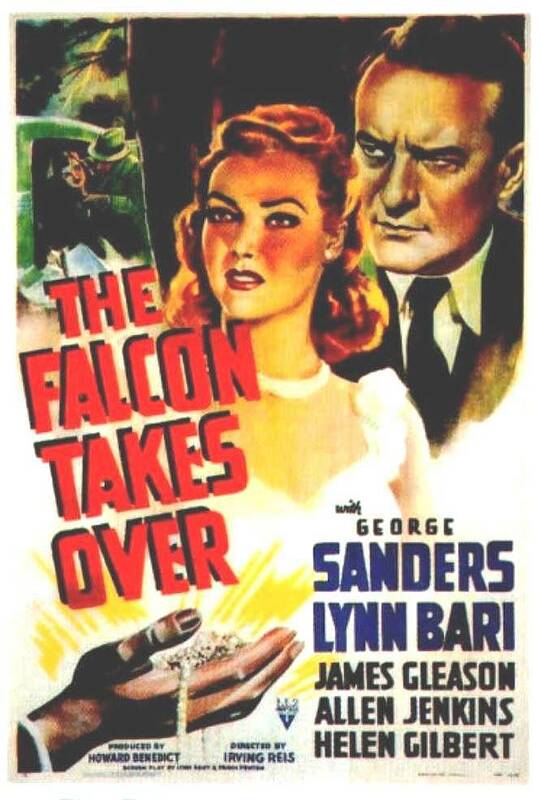 This clever idea was good news for Sanders' career and for The Falcon series, which improved with Tom Conway and produced a low-budget gem with The Falcon and the Co-eds. Still, at 65 minutes, The Falcon Takes Over is a watchable mystery and features good performances from Ward Bond as Moose and Helen Gilbert as the chilly Diana Kenyon. Judging from this film alone, it's surprising that Gilbert didn't get better parts. Although she appeared in major film series like Andy Hardy and Dr. Kildare, her career stalled after the mid-1940s, although she made a handful of television appearances in the 1950s. The supporting cast in The Falcon Takes Over also includes Turhan Bey as the fake psychic (foreshadowing his role in The Amazing Mr. X), James Gleason as a police detective, and Hans Conrad (who is unbilled). A third version of Farewell, My Lovely (with that title, for a change) appeared in 1975 with Robert Mitchum as Marlowe. It earned generally positive reviews, although I was less enthused, principally because Mitchum seemed at least a decade too old to be playing Chandler's detective. As characters I believe Gay Lawrence and Philip Marlowe would be wary of each other. Chandler's plot works well for the Falcon, but is perfected in "Murder, My Sweet". It certainly must have been difficult to have been an author hoping to transfer success from the written page to the silver screen at that time. I can imagine how Raymond Chandler felt with this entry after the far more desirable "Murder, My Sweet." It made for an interesting review, Rick. Like you, I am a big fan of "The Falcon and the Co-Eds." It has an impeccable setting and just the right amount of humor. Well. 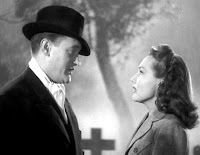 I did not know that Tom Lawrence and George Sanders were brothers. I'm keen to see "The Falcon's Brother" where Sanders is killed off. I'm a big Sanders fan, and seeing his demise as the Falcon would be highly satisfying. TV Western Themes: "Branded" and "The Virginian"
We Describe the TV Series...You Name It! "The Long, Hot Summer"...the TV Series!